Interview, photos & live videos captured by Brad Parmerter unless noted otherwise. Bp: I wanted to throw out some song and album titles to get your initial reaction, whatever comes to mind first. We’ll start off with the big one, "Christmas Eve/Sarajevo 12/24." Jeff Plate: Uh, oh boy. Trying to think of the correct way to put this, let me just say when this song first appeared on the Savatage record we all thought Paul was crazy. Because it was like, "What? Why is this Christmas song on this record?" And granted I mean it sounds like it belongs there, but still his initial idea was bizarre at best. And lo and behold that's the song that has afforded all of us to be where we are right now. It's been kind of, I don't know if shocking is the right word but, I'm trying to get the right way to describe it. You know what? I would say the song is undeniable. So it didn't matter, I don't think it mattered whose record it was on. That version of that song was just a hit. It didn't matter to people who actually performed it. They heard that song and they loved it, so maybe that's the right word, undeniable. We did not know where this was going to take us and the production of that version of that song was so strong there was no denying it really. It was going to happen. Bp: Jumping to another Savatage track, "Morphine Child." Jeff Plate: European. It’s got that militant cadence to it, you know what I mean? When that song first came to light I could picture us playing a festival with the audience bouncing up and down to that song or playing any venue or show in Europe and having them bouncing and reacting, fists in the air. I really loved playing that song live and Jon sang it so well. The verses are just so dynamic and every time we played the song it was a blast. We had a great time doing it. Bp: I can't remember if it was Chris who had mentioned at some point that it was a possible contender for TSO when you guys went to Europe for Beethoven? Jeff Plate: I'm sure it was possible. There are a lot of these Sava songs that were deemed possible. That certainly could have been one of them. Bp: Do you like doing the old Savatage material with TSO? Jeff Plate: The way I look at it is this: this material that Jon and Paul wrote is their material. They are free to do what they want with it and I think Paul over the years or years ago when a lot of this stuff was being presented and recorded, this whole TSO thing is really what he was envisioning the whole time. He just wasn't able to do it back then. So for instance, "The Mountain," which was "Prelude to Madness" on Hall of The Mountain King, having this big orchestration and this visual thing is I'm sure what he's had in his mind the whole time. There are a lot of these songs that, like I said before, I didn't really know much about Savatage until I joined the band, when I got into the catalog and started learning these songs and really starting listening to what was going on here, it was like, "Holy cow, this is some great music!" And there's a lot of great music that a lot of people don't know so if this is a way to get some of these songs and some of this music to the ears of people who have never heard it before, then I'm all for it because there’s some great stuff. And you can probably say this about any band, but having been here this long and knowing some of the music that I've heard that even Savatage hasn't performed live, there are a lot of things that people have never heard and I think that they would equally enjoy. And now that we've got any vocalist we could possibly need to pull it off, any instrumentation that we need to pull it off, I'm all for it. Because honestly I think these songs sound fantastic, I think they did in their initial form. I've got no problem with it at all. I think it's something that really helps present this thing. I mean the song "Chance," Savatage could never, without playing to tracks, there's no way that Savatage itself could ever perform that song as it is out there on the record. But with TSO you've got all the vocalists for the counterpoint, you've got all the keyboards, all the orchestration in the background, plus the orchestra itself and the hugeness of the band. I think that song in particular is one of those that was kind of designed for TSO, but Paul just didn't have TSO to do it at the time. Bp: He was a few years too early but it was a TSO song before TSO was around pretty much. Jeff Plate: And that goes to my point of this idea bouncing around in Paul's head for years. This was what he and Jon…they were working on Romanov with Kinkel and this whole thing has been bubbling underneath so to speak and then it finally, "Boom," it happens. So songs like "Chance," and I say "Chance" in particular, that was something that's TSO if you ask me. For the Savatage fan at that time to hear a song like "Chance" is like, "Holy cow, where are these guys going now?" For example, the Handful of Rain record opens with "Taunting Cobras," it's a metal tune. A couple of songs later you're into "Chance," now where are they going with this thing? But this is the direction and some of the things that Paul was looking to do. With TSO we're able to go out and recreate, bring to life, what he was presenting back then so I think it's great. Bp: Under the TSO framework you have the ability to go out and do almost anything that you want. I mean from "Chance" and heavier material to something like "For the Sake of Our Brother." You have the freedom to do anything under that umbrella. Jeff Plate: Certainly. And we should. That goes to my point where at the time Jon and Paul wrote these songs, and just because they were recorded x amount of years ago doesn't mean that they're not great songs, that they still don't deserve to be presented to a different audience. In general with a lot of bands, you get caught in a niche of what you listen to musically and there may be some fantastic music out there that you've never even heard before. We now have a chance to take some of that music that a lot of people have never heard and present it to them and this is about the best way to do it especially when you're involving the counterpoint and the orchestration and everything else that was coming about back then. Bp: Well "Chance" specifically worked so perfectly on the Beethoven tour. People who didn't know about the Savatage connection would just assume that it's a new TSO song that's not on a record yet. Jeff Plate: Exactly. And here again, it's a great song! I mean it's powerful, it's dynamic, it's got all these elements to it that are exactly what we're doing now with Trans-Siberian Orchestra. Yea, that one was really a no brainer I think. There are some other things that are being kicked around and I'll be honest with you, we're going to Europe and we're looking at stuff as we speak as far as what is a possibility. When we get over to Europe we've got some things that we certainly know that we're going to play and some other things that we're going have to figure out. And some of these Savatage songs we've got on the ‘figure out’ list. So it'll be a good selection I'm sure. Bp: I wish I was going over there. Jeff Plate: It's gonna be great. Bp: Going back to the songs, "Tracers." Jeff Plate: First time I heard it, it was something I believe that Al and Jane and Paul kind of had the riff; I always liked it. It was just one of those things that when it started happening I was like, "Wow, that's cool." Then once we started doing it live, it was a real dynamic live song. It was great for the production. Here again you’ve got orchestration in it, you’ve got the background vocal thing going on, the guitar work, and the violin that was involved. It had all the elements of what we do, so it was cool. We miss playing it. That's a song that always went over well. Bp: The Wake of Magellan. Jeff Plate: This is Savatage, Paul and Jon expanding beyond the normal rock band element of it. "The Hourglass," now you want to talk about a song that's TSO-ish; there you go. "The Hourglass" on The Wake of Magellan is what "Chance" is to Handful of Rain. So you've got a real variety of elements but it really all comes from the same place and has a certain distinct sound to it. That was a really good record and there's something there that...once the Dead Winter Dead band or Savatage, as we know it now, I guess you could say, came to be with you know myself, Johnny, Zak, Jon and then Chris Caffery and Al coming in on guitars, that European tour that we did with Dead Winter Dead was phenomenal. So when The Wake of Magellan came out that was on the charts in Europe. We went back over, we did another couple of good strong tours and a bunch of festivals and it was well received. I mean that audience over there just really loved what we were doing on those two records. Bp: Leading nicely from that to the Poets and Madmen album. TSO had a couple of Christmas albums out and had a tour or two under its belt, what are some thoughts or memories about the Poets record? Jeff Plate: Well initially, Zak leaving the band for me was very disappointing and everybody's gotta do what they’ve gotta do and I don't want to get into the details of it. Zak is and was a friend, will always be a friend. He's the guy that brought me into Savatage and I will always have the utmost respect and appreciation for him for doing that. So when all this went down it was also at a time when TSO was really starting to happen so to speak. We had two Christmas records under our belt. Both sold well. The Beethoven CD was happening, that was all kind of happening at the same time as the Poets and Madmen CD. Then the touring aspect of TSO was happening, so things had kind of shifted. The plans for Savatage were now changing because of what was happening with the Trans-Siberian Orchestra. And I am not faulting anybody in respect to all this because when TSO started happening it was something that, "Okay, we need to jump on this train now and see where this is going to take us and do everything we can to make this work." And you've even read before in Jon Oliva interviews and stuff like that, Savatage at that point had been playing and working for around 15 years trying to crack the mainstream so to speak. For whatever reason it just really didn't happen. So you've got TSO that is doing that very thing so the energy and the priority at that point was on TSO. Poets and Madmen came out and obviously Jon sang every song on the record. Poets and Madmen is probably my favorite Savatage record that I've done. I think besides Live in Japan, which was my first recording, so I'm always going to have a huge spot for that in myself, but the Poets record I really love the songs on it. Every song on it I think is really strong. The production sounds good. Jon sounds great. And honestly we were, aside from the changes that were going on, me and Johnny and Chris and Jon were all in a really good place. I remember just having a blast doing that record. It came out and then we brought Damond Jiniya back in to do some vocals with us on the tour. Then things were kind of changing all around us at that time, but the record itself is honestly one of my favorites; one of my highlights with the band. Bp: It's a great one to have been the last one recorded under the Savatage name, but it's a little sad that lineup didn't produce something else since there was obviously some magic happening. Jeff Plate: I agree on both counts, yup. But having just explained to you what is involved with the TSO machine there were so many things going on at that end of it. And you’ve got to understand too, it isn't like Savatage was a small band either. So when you put this thing out on the road, we are not kids, we're not going to go out in a van and eat bologna sandwiches. You’ve got to do this with respect to yourself and it just became a little more difficult to carry on with it. But you are right, I completely agree with you. I think it's unfortunate that we didn't carry on with more of that direction, but at the same time I'm very happy that is what we are left with. You hate seeing a band say farewell off of a weak record. And like I said, this is one of my favorite records. From the production down to the songs, down to my playing personally, all of the above. I think it was a really good way for us to end that part of it so to speak. Bp: If that ends up being the last recording under the Savatage name, it's a great one to have gone out on. Jeff Plate: Sure. And to that point, who knows, anything's possible. Bp: What are some particular favorites that you are playing live now? Bp: With TSO that you get off on playing. Jeff Plate: Oh God, that's a good question. Jeff Plate: No, because each one has its own coolness to it, you know. Like the openers that we do, those are some pretty interesting songs. I mean for me, I’ve got to be on my toes when I'm doing this stuff because the parts as they change, the tempos as they change, they're fun songs to play. When we hit "Faith Noel," I love playing that song because you're really kind of opening the whole thing up to the audience. The first two songs the audience is hearing some music a lot of people don't really know, but the production is really strong. You're hitting them with all this and then all of a sudden you come out with "Faith Noel" and everybody knows these melodies and the whole audience just reacts; the audience opens up. "Okay, now here we go." "Wizards" is obviously a great song to play. You know, one of my favorite songs on this tour to play is "Christmas Dreams." I think Russell Allen does a fantastic job with the song. It is a good rock song. This band plays it really well. So I enjoy that. And even to get on a sillier note, "What is Christmas?," Rob Evan goes up there and does his thing and I enjoy it every night. But you go to the back half of the show, obviously "The Mountain" with the production and everything involved with that. "Mad Russian's" is always fun to play. "This Christmas Day," here again, our audience knows this song and they're all standing, they're all clapping, they're all smiling, they're all just having a ball with it and that's great. So there really isn't any one in particular because they've all got their highlights and their emotion to it that has some sort of connection with me one way or another so it's the show I would say. Everything about it, from when it starts ‘til the end, is great. Bp: Are there any parts of the show that you, maybe not look forward to, but that you'll key off of either an audience reaction or a certain part of the show where you gauge the audience from? Or something you look forward to seeing a reaction from the audience every night? Jeff Plate: Well for me one of them is when Bryan Hicks [the narrator] steps into the light for the first time. If we get a good, strong reaction, if there's applause for Bryan before he even speaks, then I know we've got a great audience to work with because they are reacting to Bryan because they know Bryan. They know what the show is, so we've got our people so to speak, the audience that we're playing for; we know it's gonna be a great night. On the other hand, you play some places where you have a good portion of the audience that really is new and doesn't know what they're getting into. At the same time, at the end of the show, it's a standing ovation at the end of every show. So whether it starts out like friendly territory or not we always seem to win them over. Bp: How do you keep it fresh for yourself mentally needing to be so sharp, considering if you go off the rails everyone goes off the rails? With so many shows in a short period of time and a grueling schedule, how do you keep yourself mentally sharp? Jeff Plate: Well ironically, I think part of it is to not overthink it. We rehearse like we tour. When we get to Omaha it is full on flight the day of rehearsals. So you're out there, you are drilling this into your head and into your muscle memory from day one. The whole key to this thing is being as good as possible and with Al Pitrelli, MD on the west, and Derek Weiland over here [on the east], our musical director, there isn't anything that gets by. So if there's a fuzzy part of a song or even a part, or a change, a drum fill, a guitar solo, whatever, that’s "Wow, that sounds weird, let's go over that a few times." This stuff is just constantly drilled into us and I've never taken anything for granted. So honestly if you think too much about it that's probably when you're gonna have problems. I think I figured last year that me and Caffery have played "12/24" and "Mad Russian’s" between soundcheck, rehearsals, and gigs at least 1,500 times apiece. So I think we know the songs, but you can't be too distracted with your playing. You’ve still got to pay attention to what you're doing and everything, but if you really start overthinking stuff I think that's when you get into a problem with this. If there is anything that ever just seems wrong, we have it on video, we've got ears all over the stage that’ll bring it up. We get on the band bus every night and if there's something that was just a little off kilter, we talk about it. Everything is always kept within check. I honestly am surprised when we go to Omaha after we have our spring and summer off and we start playing through some of these songs how muscle memory comes in and you're actually able to do it without ever rehearsing it before you get there, it's really kind of strange. But that wouldn't happen if we didn't already play the thing at least 1,000 times. There's a lot of work involved. Bp: You mentioned earlier subtle changes that you may put in to try this or that. How does that work when your muscle memory has ingrained a pattern for so long without overthinking it? Do you need to notch up that concentration a little bit more when you go into a different fill or different pattern in that case? Jeff Plate: Yeah, I mean there's a lot of this stuff that really has to be the same. There's only a few songs where it lends to being able to do something different. "The Mountain" is one of them. It's kind of an open rock song and it is open in a couple of spots to do some drumming. And it’s never something that's drastic. It's always just a couple of notes here or maybe a flam or maybe just something simple. But sometimes you play things that you think sound great that really don't and sometimes you might play something you don't think was right, or it might have been a mistake, and you listen back to it and go, "Oh wow, that was actually kind of cool." Well that blends into the whole idea of videotaping every night, looking at something that we may have done a little differently that was right or wrong and you don't really know until you watch it back because everything goes by so fast. But yeah, for the most part everything is really all within ballpark. It has to be, but there's a couple of spots where you can try a couple of things here and there. Bp: Are there a couple of fills near the end of "This Christmas Day" that were there last year, but aren't there this year? Jeff Plate: Yeah, there may be something that is there now that wasn't also. Here again it's just once in a while you just do something and…there's a fill that's done at the end of the song I think I did about a week and a half ago and I did it and it just kind of happened. I looked at Derek and he kind of gave me one of these nods you know, and a smile. I thought, "Ok, that looks pretty cool." So these things kind of stick and that's how this happens sometimes. It could be even something one of the guitar players may do. It just kind of happens off the cuff you know, "Wow, where did that come from? That was kind of cool." This is how these things happen and trust me, whenever something happens that isn't right, I know it and it doesn't happen again. Bp: [laughs] As the drummer you to a degree hold the band together and thus have a unique and close relationship with the Musical Director, how has it been working with [Bob] Kinkel, [Al] Pitrelli, and Derek, as far as the three different MDs over the years? Jeff Plate: Well all three of them are brilliant and there isn't anything that gets by especially when it comes down to the theory end of things. Derek was Julliard, I think Kinkel was Julliard also, and Pitrelli was Berkeley. I mean these guys are well educated, well rounded musicians that know theory inside and out. So everybody's got their own approach to it and that just comes along with all of us as individuals too. You know I've played things differently and feel differently than John O'Reilly. Even though we may play the exact same thing, it's different. These guys hear certain things and their personality – this is what they're hired to do – their personality kind of plays into the music and it's got to mesh with us and vice versa. I love working with Derek. I always loved working with Bob, he's just such a good guy. And then Pitrelli, just like when he joined Savatage, it became better because musically he was more educated, let's put it that way. When it comes to TSO, Al is all over it and I love working with Al. There's always room for improvisation, there's always room for ideas, but when it comes right down to it, these guys are the musical directors and it has to go through them. And once you work in this situation you have to understand that and deal with that. I've been here long enough that I've earned my stripes that I can suggest things and apply some things maybe more than a rookie can. But at the same time I've been here long enough to understand what this thing is asking for musically where a lot of times we don't have to really discuss things. We know what is right and what's wrong. But those three guys in particular, all three are awesome. I enjoy working with all of them. Bp: Congratulations on the new Metal Church album. Bp: Generation Nothing sounds great and after you get off the road with TSO you don't have that long at home before you hit the road again. Jeff Plate: About a week or so. We've got a month of dates with Metal Church. You know, Metal Church and Savatage kind of almost walked in the same footsteps throughout their careers. Great bands, great songs, great records, great live reputation, this and that, but just because of bad management or individual stupidity and problems, things don't always go the way they should [Savatage had a notoriously bad management issue in the mid-80s before Paul O’Neill was introduced to the band and worked with them on Hall of the Mountain King]. When I got into Metal Church I was invited because I had known [Kurdt] Vanderhoof for several years. 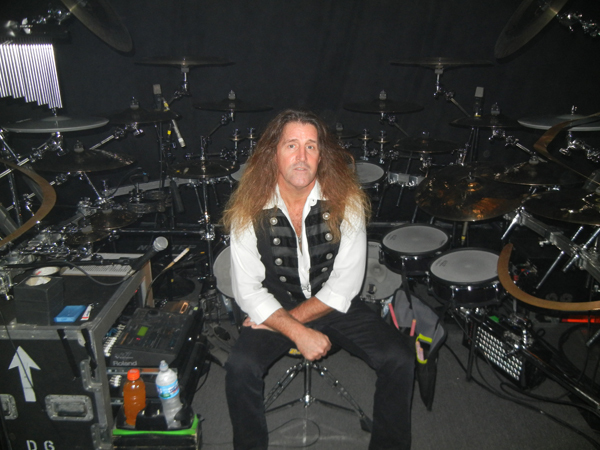 I was actually touring with Chris Caffery, we opened for Metal Church over in Europe and I got to know the guys really well and of course Kirk Arrington, the Metal Church drummer, was having health issues and some other things were going on and it was kind of a struggle for him. I knew it then and after that Kurdt was writing A Light in the Dark and trying to figure out how to proceed with the band. Kirk wasn't able to do it so Kurdt called me and I said, "Absolutely." I didn't even think anything about it. Metal Church is another band that once I really started getting into the back catalog and listening to some of this old stuff I realized why the band had such an incredible name. So A Light in the Dark was my first record with the guys and we too ran into some problems with booking, some management problems, some overall operating problems. After we did This Present Wasteland it really kind of just became one of those things where it was so much work and aggravation to actually do shows. And to the common person it may sound petty, but when you're not able to go out with the proper crew and people around you to make your show better and you go to a club and the monitor guy in the club is making out with his girlfriend or he's drunk or something and you sound like crap it's like, "Why am I doing this?" This is kind of what we were running into. So Kurdt, out of respect for himself and all of us just said, "Let's put an end to this." So we did Rocklahoma, I believe that was in '08, and announced then that that was the last gig so on and so forth. And then over the years we've obviously all stayed in touch. Ronny Munroe had his stint with TSO on vocals, Kurdt Vanderhoof was actually running sound for TSO west for a number of years so we were always in the vicinity to talk to each other and there were always offers to play shows and to do this, but then you look at things and go, "How much is it going to cost us to get there? What are we going to make in the end? Is this really worth it?" And finally we were offered to do the 70,000 Tons of Metal cruise this year in ‘13, the beginning of February, and it was something that we all discussed and said, "You know what, this really sounds like fun. Why don't we go ahead, let's get together for a week and rehearse, let’s go down there, do this cruise and have fun." That was the main motive of us doing the show. ‘Cause we're doing a cruise, we're sailing to the Turks, we're getting paid for it, we're getting fed, it's like, "What the hell, let's go have some fun." So when we did the performance on this ship the reaction was so strong from not only the fans but our peers and the press, we said, "Ok, what are we gonna do? We just got a little new shot of momentum. Why don't we do this and let's try to be smart about it." Of course we had to discuss how we were gonna approach doing the record without a record label, without financing, and how are we going to go about touring. Part of the inspiration for this record was the fact that on this cruise we did the entire first record, the very first Metal Church record ever, which was a lot more thrashy, a lot faster, more aggressive, and we took this whole vibe and kind of brought it over into Generation Nothing. So Generation Nothing, even though it was put out in 2013, it sounds like a record that could have been done back in the late '80s or early '90s and that was the whole intent. So right now the reaction to this new record has been really strong, we've got these tour dates set up here in the States for our first month, and we've got some stuff going on in Europe and we are looking to hopefully do a package in the States and really try to work the American market really strong this year. So things are looking good, but for a while it was kind of bleak and once we thought about it and realized, "If we're going to do Metal Church we should do this NOW while we're all still able to do it. We have the time and with the 70,000 Tons of Metal we had a buzz. We have to get to the fans so it was time to take advantage of it so that's what we're doing. I'm really happy with the record. It's my favorite one I've done with the band so far and I think this tour is going be a lot of fun. I think we're going to reestablish the band as one of the major metal players that's out there. You’ve got your big four and Metal Church was right there in the beginning of it with all those bands: Megadeth, Metallica, Anthrax and Slayer. They were all happening at the same time and Metal Church had its share of issues which kind of derailed things and sidetracked it, but our goal is to get the band reestablished and get right back up there so we can go out and do some of these shows with these other bands. I think it will be great. Bp: That's awesome. Well you've got a great record to stand on. Bp: So I don't keep you all day long here, I appreciate the time that you've put into this already, circling back to TSO for one last question. I know from a fan perspective how important the signing line after the show is to have some contact with you guys and tell you what we thought of the show, get an autograph, share a story, and stuff like that, but from your perspective, especially after doing multiple shows for multiple days, you might not want to be on for another hour or so after a long double-show day. How important is it to you to do the signing line and to have that connection with fans? Jeff Plate: Well for me it’s critical. I mean, this is part of what we do. There really isn't much more to think about than this is part of the job. Not to sound cold about saying this is part of the job, but that's the reality of it. Signing my name on a program is the easiest thing I do all day, you know. Yes it does take up some time, but it is part of this connection that the band has with the audience that keeps them coming back. I mean I have been able to do this now for 15 years. If we didn't do this, I think it would be different. But I think these people, as much as they have connected with the story and the music, the fact that they can actually stand there and say "Great show" and "Thank you" and shake your hand and see you as a real person, that connection there just keeps them coming back. And for a lot of people it's inspiring in a way, especially when you get some young kid coming through, some young aspiring drummer, "Hey, here's a pair of drumsticks. Contact me through my website, pick my brain if you need some help or advice" or that kind of thing. If we don't sit there and meet these people I'll never have those opportunities. And that goes for all of us. These young girls that come through the line and look up to Kayla and Georgia, and the others, that was Kayla and Georgia when they were 7 or 8 years old. That kid that comes through that's 12 or 13 that wants to be a drummer, that was me when I was 12 or 13. So just to have that, even though it's a moment, to say hello or to shake hands, to maybe even wait around to get a picture with us, that changes somebody's life and I think that's just huge for what we do. Granted Sunday night after we do three doubles in a row, I am shot. But you go up there and you do this and it's all good. I've never missed a line and there's no reason or no room for complaining about being tired or whatever because this person just spent x amount of dollars to come see you and you're going to make yourself available to go up and see them, you know. You should do that and be happy for it because you could easily be that person in the audience that bought the ticket. But we are lucky enough to be on the stage doing what we're doing so to go back to my first remark, signing my name is the easiest thing I do all day and that's really how I approach it. To say "hello," smile at somebody, tell them thank you and sign my name; that's a piece of cake. Bp: And even if you are exhausted, it's got to be somewhat invigorating to have a few hundred smiling faces coming up and saying "Thank you for a great performance and for entertaining me for the last three hours." Jeff Plate: Yeah, and it lets you know that a job’s well done. You know what you’re doing is connecting with people and they truly appreciate it. Of course everybody's different that comes through the line. There are some people that just are completely blown away, that show just kind of makes their life. You know they've got something that they focus on doing every year or this is what they're going to do with their family now, that kind of thing. Then it goes from all the way from the young person who's aspiring to be me up to grandparents who are like, "Wow, I actually recognize some of this music" and hopefully they'll come out here and rock again without having to go into a club. So it allows people to kind of step out of their own box I think and really enjoy themselves at the show and you see that a lot. I always like to see when the older people come through the line and they were just so happy that they were brought to the show because for some reason or another it just injects some energy into them and then makes them feel great. That's what it's all about. Bp: They didn't know going in that it would bring up all these feelings or kind of bring out their youth a little bit. I've been bringing my dad since 2004 and his favorites were always Ray Charles, Willie Nelson, Anne Murray and Preservation Hall Jazz Band, but it’s an annual thing and he’s seeing his 12th show tonight. Jeff Plate: Yeah, and there’s a lot of people who’ve never been to a show and have only heard about it. They are skeptical and I don't blame them at all. But I think at the end of the day when the show finally ends, whether you are just a young person that's blown away by the size of it and the presentation or you are an actual musician or somebody in the industry or you're old enough to realize the amount of work that this group of people just put into the show and the performance that went along with it, I mean we do what we do very well. You're going to have your naysayers and that comes with everything, but we go out there and we play with as much passion and seriousness as we can. I think for the most part that's what everybody really understands and respects. If you're not a classical music fan, if you're not a rock fan, if you're not a whatever fan, I think if you come to see our show with an open mind, you're going to really respect what we do and hopefully come back to see it again. Bp: There are so many different styles and different textures that you're bound to find something that you like. What's great is, you're the drummer in a rock band who gets the opportunity to delve into all these different styles. You’ve got one of the best jobs in the world. Jeff Plate: Yeah, there is a variety of everything here. If you are a music fan of any type, whether you are a guitar player, which we have phenomenal guitar players, phenomenal bass player, everybody on our stage is great, and if you come from any one of those instruments to any one of those schools you’ve got to be able to just put your ego aside and realize, "Wow, these people are very good. They're obviously well-rehearsed and they’re pros." So here again, you take away from it what you want. If you don't like the story then fine, if you don't like all the fire that's fine or whatever. But at the end of the day I think that we do what we do with a smile on our face and I think you can tell that we truly enjoy it from an audience perspective. My group of guys here on the east are just a blast to play with and I think that translates to the audience every night. So whether it's music or whether it’s looking for an escape for a few hours and coming to have some fun, it's all there for you. Bp: You guys never cease to amaze me. Tonight will be my 50th TSO show and I’m looking forward to it! Jeff Plate: There you go. That's awesome. Bp: Well I really appreciate the time, Jeff. Jeff Plate: You got it, Brad. We'll see you later on this evening then.